The Port of Kalundborg is secured against terrorism – but you can still move about and work in most areas. All larger ports are secured against terrorism – also Kalundborg. All ports harbours are secured because ships – just like planes and other means of transport – can be used for terrorist attacks. 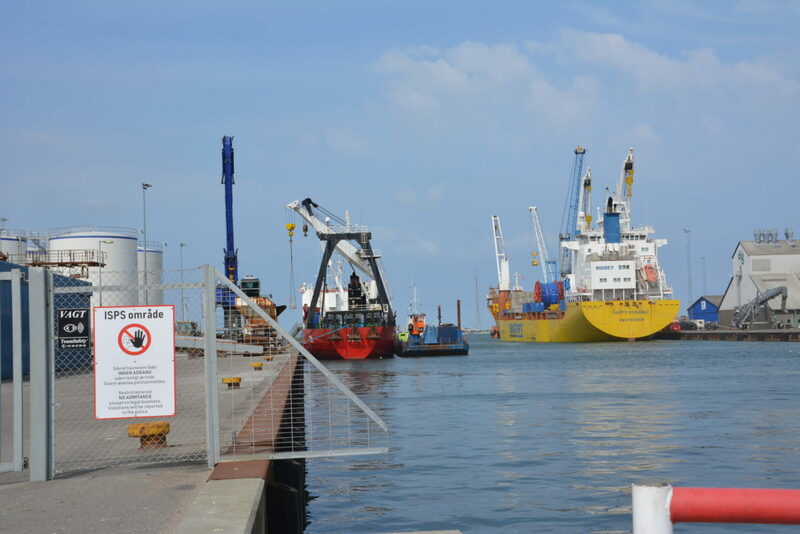 New international regulations stipulate that if a port is used by ships of over 500 gross tonnes,it must be secured against terrorism by 1 July 2004. Six areas have controlled access when there are ships in the port. Six different areas (see map) in the Port of Kalundborg have been secured with new fencing, gates, and the option for access control. It is important to be aware of the sign “ISPS område” (ISPS area), which is displayed in the area when a ship is arriving. In these cases there will be a requirement for ID, and during heightened security there will be gate control. You will still have access to the six secured areas when there are no ships present, and no arrivals expected. However, take into consideration that quays can be closed periodically. This can occur due to the presence of goods or materials in the area, as these are often the target of vandalism. Why is there security against terrorism? • that weapons or dangerous materials or objects – that can be used to attack people – are brought into the area, or onboard a ship. • that unauthorised persons get into a secured area. • that something is done to cargo, or equipment for cargo handling, at the particular port facility. Security against terrorism operates at 3 threat levels. Level 1 is the lowest. If the government increases the threat level, there will always be gate security. You are welcome to contact the Port of Kalundborg’s administration at (+45) 59 53 40 00, to learn more about security against terrorism in the port’s area. We can, among other things, give you information about obtaining ID cards.